The Apple EarPods with Lightning Connector have been engineered to maximise sound output and minimise sound loss, resulting in high-quality audio with richer bass tones. 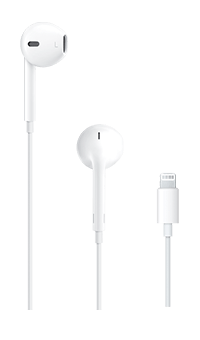 The EarPods include a built-in remote that lets you adjust the volume, control the playback of music and video, and answer or end calls with a pinch of the cord. They're also compatible with all devices that have a Lightning connector and support iOS 10 or later, including iPod touch, iPad and iPhone.